Is Remington S8590 worth the money? Pros: : 4.6 / 5 in the Overall Quality Rating. Great price to value ratio. Fast heating up and, unlike some other irons I know, this Remington really does infuse your hair with keratin. Result - better protection and longer-lasting results. Heats up fast, light in hands and modern design. Automatic shutoff feature. Cons: Reported faint odor for a few days. If you’re looking for the best hair straightener that’s just perfect for your strands but are overwhelmed with the variety of products available in the market today, I offer this unbiased review of the Remington S8590 hair straightener. Read on and find out why this is my hair styling tool of choice for beautiful tresses. As a former stylist, I’ve used countless hair styling products through the years. So trust me when I say that I’ve come to rely on the Remington S8590 hair straightener. I have found out that it not only functions as a tool to give my clients the best tresses for their special occasions. More than that, it also protects and nourishes their hair. My work as a stylist entails that I work with different hair types and lengths — both a challenge and a joy on its own — but the satisfaction I felt in my work came more from the happy and grateful smiles of my clients whenever they would look in the mirror to see their newly styled hair. It is able to style tresses to perfection. It nourishes and keeps hair healthy. It achieves the hairstyle that will put a pleased smile on your face. In this post, I will share with you my thoughts on the Remington S8590 hair straightener. 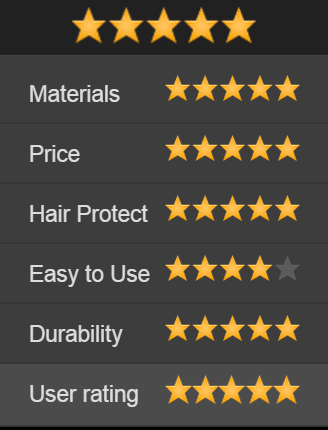 For my review of this particular hair styling tool, I used the special method I have developed for rating hair straighteners based on Amazon.com customer reviews and my own experience. What features makes the Remington S8590 top-notch? Keratin ceramic-coated plates that keep hair healthy, shiny, and pretty while keeping it straight. Keratin, the super protein that makes hair strong, is infused into each strand with each use. Heat protection sensor that adjusts according to your hair’s quality and texture so you don’t end up with burnt hair. The sensor is intuitive enough to detect your hair’s moisture levels and adjusts the heat as needed. Ultra-fast heating time for on-the-go hair styling. It heats up within 15 seconds! Keratin Protective Technology that’s built into this hair iron to prevent hair from breakage and damage — by as much as 57% more than other hair styling tools! Here the top 5 advantages of using the Remington S8590. 1. It heats up fast. For those mornings when you’re in a hurry to get to work or school, this Remington hair iron does its job of delivering straight and shiny tresses pronto. This means you don’t have to wake up at the crack of dawn just to achieve fabulous-looking and ultra-sleek tresses. Because it heats up fast, it can get to work pretty quickly. In my many years as a hairstylist, I’ve dealt with clients who are in a hurry to have their hair styled. With Remington S8590 hair straightener, I didn’t have to worry about angry, impatient, and dissatisfied clients. 2. The keratin effect of this hair gadget is real. It doesn’t dry out or damage your hair. All you get is perfectly straight, keratin-infused healthy hair. One of my longtime clients was happy to report to me that this hair iron miraculously kept her hair straight for two whole days. And she even had thick, curly hair! 3. It doesn’t weigh like a rock. For women’s delicate fingers, this is perfect! It’s so lightweight that straightening and styling hair is a cinch. 4. The temperature control is adjustable, depending on your requirements. This is a new innovation among hair straighteners. Now, you have full control on how hot or cold you want it to be, even if you need something as hot as 230 degrees Celcius. 5. This product is also completely safe. Thanks to its automatic shut-off feature when it is left unused after about an hour, your home or salon is kept completely safe and hazard-free. As for this product’s cons, I have only two quibbles. I couldn’t find anything else wrong with this product aside from these two points. With such a great product like this one, I actually had to force myself to think of its not-so-good features. First of all, when some women use this product at home, they complain of a smell resembling burnt rubber emanating from the product when they use this. It could happen, that’s true. BUT (and I mean BUT), when using the right settings and if the product is used properly according to the manual, then you shouldn’t encounter any more problems. My second quibble with this hair product is that it tends to catch some hair sections on the strip down the middle. However, this is a small matter since it occurs very rarely. Just be careful and gentle in handling your hair so you wouldn’t have any mishaps. My Overall Quality rating is 4.6/5 stars which is pretty darn good, especially with the price tag in mind. Now, are you convinced that the Remington S8590 is the best hair straightener in the market today? As a hairstylist-turned-blogger, I’ve had my share of good and bad hair straighteners. And the Remington S8590 is the best, thus far. It styles your tresses to salon-perfect hair, and at the same time, it protects your hair with its fabulous keratin feature. My quibbles with this product are not major deal breakers as long as you follow the manual instructions and handle your hair gently. It is hard to go wrong with such a nifty, nice-looking, reasonably priced, and feature-packed hair straightener. So get this best hair straightener in your hair care collection now! The only issue that we continue to see with the winner in this category is that (probably because of the price) it’s often unavailable. Before we move on to take a closer look at each of the 3 top rated hair straighteners for normal hair, let’s see the list and their ratings. Now that you have glanced at these three lifesavers in the jungle of a market, let’s give each of them some more attention, so you can get better acquainted with one of your future best friends. Think of it as the season finale to the Bachelorette, only you would be choosing a flat iron you would be spending most of your life with. Summarize what each company is saying about their hair straightener. Look at what other happy or dissatisfied customers are saying about each product and take their words into consideration. You will get my 100% honest opinion about each product we are reviewing today. Hopefully that we will be of some help in your choice making. Anyway, let’s meet our winner and the two runner-ups, shall we? This all sounds pretty good, especially having the price in mind, but we need to aware that this in not the “meat” of our review – it’s the opinions of people that use it. My wife says it was easy to use and she got apparent professional results doing it herself. I really loved how good they straightened and curled. They gave me beautiful curls and when I wanted my hair straight and it straightened right up. By far these are the best flat irons I’ve ever had. They didn’t burn my hair or leave that burnt smell. I plan on purchasing from them in the future. I received my item in two days. I used it to curl my hair and I have to say it works better than a curling iron. I love it! Clearly, that is a long list of positive experiences, and these are chosen carefully out of thousands more. I was close to sending it back because I couldn’t turn it on, so I forgot about it for a couple of days. Then I decided to give it one more shot. The reset button was hard to press. But once I got it going it heated up very fast and my hair stayed straight for two days after. With the 1000s of reviews on Amazon and with most of them being positive, we are starting to get a clear picture about why this iron has been on top for almost a year now. Its number one advantage to me seems to be that is doesn’t pull your hair. And we all know how important that is. Imagine getting traumatized every day by an appliance just because you want to look your best. Another big forte is its unparalleled speed, both when it comes to heating up and the straightening. The CONs here are not as strong and universal for me to find a true quality issue. Most of the negatives are, in my opinion, subjective and clearly individual cases – people who got efficient help from the customer service, which, again, is recommendable. Again, while it’s priced this low, it’s a true bargain. Right off the bat this flat iron comes with a 3 year warranty! The swivel cord makes angling simple. It’s slick, easy to handle with well balanced weight, has programmable temperature control. It simply puts the other irons that we have to shame. One thing that was a minor peeve: the digital read-out for the temperature is in Celsius. The product heats to 450 degrees F but the read out will be in Celsius. Not a bother for other countries but not so much for myself born and raised in America. The conversion isn’t second nature in our household. This hair straightener is somewhat different than the HSI. That doesn’t make it clearly better or worse. It’s more accurate to say that it’s suiting a different sort of a customer. It is clearly a great piece to own if you tend to get ready in a hurry. Perhaps you are way-to-busy with your job or family to have too much time for doing your hair, or you are a young urbanite living a hectic life who wants a perfect hairdo in just a jiffy. It is clearly not the right choice for those who cannot get used to temperature in Celsius, which is a shame, since that is the only relative “drawback” this flat iron has. With this very ambitious and confident description, I couldn’t wait to see what real users of the product had to say and whether it is compatible with the company’s statement. Let us get to that. Clearly, Remington is a big name in beauty products and electronics, from hair dryers to some of the best leg shaver made. There is no denying it. And for those who prefer to buy a brand name, this will mean something. If you are all about the heat and speed, this product might be for you, since it reaches the highest heat mark in seconds. It is rated lowest of the 3 – 4.5/5, but it’s still one of the three best hair irons for normal hair. In contrast to the HSI, this product was made to be quality for a budget. You should bear that in mind when making a decision. It’s becoming increasingly hard to writing these final thoughts without sounding biased since “the reign” of the HSI started. But there is no way around it, yet again, the HSI is the superior product and there’s no way around it. And while the other two flat irons might be better suited for specific niches of the market, the HSI still provides the biggest bang for your buck. If you have questions or thoughts, don’t hesitate to share them in the comments or by emailing me from the contact page.